Microwave-enhanced SPPS increases the speed and purity of the synthesis of unsymmetrically branched peptides. 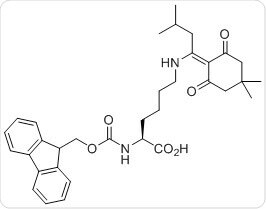 It has been demonstrated that a lactoferricin-lactoferrampin antimicrobial peptide (LF Chimera)1 can be synthesized in under 5 h and with with a high 77% purity. A histone H2B-1A peptide fragment (residues 118-126)2 conjugated to a ubiquitin peptide fragment (residues 47-76) was synthesized in under 5 h with 75% purity. 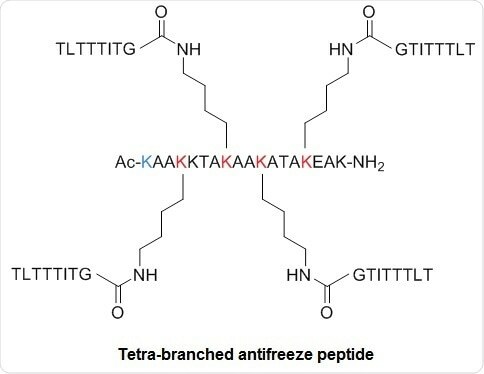 Synthesis of tetrabranched analog of an antifreeze peptide3 was carried out in under 5 h with 71% purity. The following Fmoc amino acids were obtained from CEM Corporation (Matthews, NC) and contain the indicated side chain protecting groups: Arg(Pbf), Asn(Trt), Asp(OtBu), Asp(OMpe), Asp(OtBu)-(Dmb)Gly-OH, Gln(Trt), Glu(OtBu), His(Boc), Lys(Boc), Ser(tBu), Tyr(tBu), Thr(tBu), and Trp(Boc). Rink Amide ProTideTM LL resin was also obtained from CEM Corporation (Matthews, NC). Boc-Phe-OH was purchased from Peptides International (Louisville, KY). Boc-Ala-OH was obtained from Alfa Aesar (Ward Hill, MA). Fmoc-Lys(ivDde)-OH was obtained from EMD Millipore (Billerica, MA). Anhydrous hydrazine, acetic anhydride (Ac2O), N,N’-Diisopropylcarbodiimide (DIC), piperidine, trifluoroacetic acid (TFA), 3,6-dioxa-1,8-octanedithiol (DODT), and triisopropylsilane (TIS) were obtained from Sigma-Aldrich (St. Louis, MO). Dichloromethane (DCM), N,N-Dimethylformamide (DMF), anhydrous diethyl ether (Et2O), acetic acid, HPLC grade water, and acetonitrile were obtained from VWR (West Chester, PA). LC-MS grade water (H2O) and LC-MS grade acetonitrile (MeCN) were obtained from Fisher Scientific (Waltham, MA). The peptide (Figure 2) was prepared on a 0.1 mmol scale using the CEM Liberty BlueTM automated microwave peptide synthesizer on 0.526 g Rink Amide ProTide LL resin (0.19 meq/g substitution). Deprotection was performed with 20% piperidine and 0.1 M Oxyma Pure in DMF. Coupling reactions were performed in 5-fold excess of Fmoc-AA with 1.0 M DIC and 1.0 M Oxyma Pure in DMF (CarboMAXTM).5 Fmoc-Lys(ivDde) was used for K at the branched position. A solution of 5% hydrazine in DMF was used to remove ivDde. Boc-Phe-OH was used for F. Cleavage was performed using the CEM RazorTM high-throughput peptide cleavage system with 92.5:2.5:2.5:2.5 TFA/H2O/TIS/ DODT. After cleavage, the peptide was precipitated with Et2O and lyophilized overnight. The synthesis of the peptide in Figure 2 was completed on a 0.1 mmol scale using the CEM Liberty Blue automated microwave peptide synthesizer on 0.526 g Rink Amide ProTide LL resin (0.19 meq/g substitution). 20% piperidine and 0.1 M Oxyma Pure in DMF was used for deprotection. Coupling reactions were performed in 5-fold excess of Fmoc-AA with 1.0 M DIC and 1.0 M Oxyma Pure in DMF (CarboMAX).5 Asp(OMpe) and an Asp(OtBu)-(Dmb) Gly-OH dipeptide were used for the Asp and Asp-Gly residues respectively in order to lower aspartimide formation. To prevent epimerization, His(Boc) was used instead of His(Trt). Fmoc-Lys(ivDde) was used for K at the branched position. A solution of 5% hydrazine in DMF was used to remove ivDde. Boc-Ala-OH was used for A. Cleavage was performed using the CEM Razor high-throughput peptide cleavage system with 92.5:2.5:2.5:2.5 TFA/H2O/TIS/DODT. After cleavage, the peptide was precipitated with Et2O and lyophilized overnight. The peptide (Figure 2) was prepared on a 0.1 mmol scale (resin at 0.1 mmol scale for 1st strand; resin at 0.025 mmol scale for 2nd strand) with the CEM Liberty Blue automated microwave peptide synthesizer on Rink Amide ProTide LL resin (0.526 g for the 1st strand; 0.132 g for the 2nd strand; 0.19 meq/g substitution). Deprotection was performed with 20% piperidine and 0.1 M Oxyma Pure in DMF (CarboMAX).5 Coupling reactions were performed in 5-fold excess of Fmoc-AA with 1.0 M DIC and 1.0 M Oxyma Pure in DMF. Fmoc-Lys(ivDde) was used for K at the branched position. A solution of 5% hydrazine in DMF was used to remove ivDde. Acetyl capping using 10% Ac2O in DMF was performed after deprotection of K. Cleavage was performed using the CEM Razor high-throughput peptide cleavage system with 92.5:2.5:2.5:2.5 TFA/H2O/TIS/DODT. After cleavage, the peptide was precipitated with Et2O and lyophilized overnight. The peptides were analyzed on a Waters Acquity UPLC system with PDA detector equipped with an Acquity UPLC BEH C8 column (1.7 mm and 2.1 x 100 mm). The UPLC system was connected to a Waters 3100 Single Quad MS for structural determination. Peak analysis was achieved on Waters MassLynx software. Separations were performed with a gradient elution of 0.05% TFA in (i) H2O and (ii) MeCN. 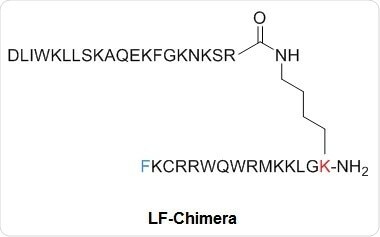 Microwave-enhanced SPPS of LF-Chimera on the Liberty Blue automated microwave peptide synthesizer produced the target peptide in 77% purity (Figure 3). Microwave-enhanced SPPS of Ub(47-76)-H2B(118-126) on the Liberty Blue automated microwave peptide synthesizer generated the target peptide in 75% purity (Figure 4). Microwave-enhanced SPPS of tetra-branched antifreeze peptide on the Liberty Blue automated microwave peptide synthesizer generated the target peptide in 71% purity (Figure 5). Microwave-enhanced SPPS enables users to synthesize unsymmetrically branched peptides quickly at with a high purity. By applying microwave energy to the synthesis of a chimeric lactoferricin-lactoferrampin peptide, the target peptide could be synthesized in under 5 h and with 77% purity. Using microwave-enhanced SPPS, a histone H2B fragment (residues 118-126) conjugated to a ubiquitin fragment (residues 47-76) was synthesized in under 5 h with 75% purity. Conventional room temperature synthesis of Ub(47-76)-H2B(118-126) requires over 53 h of manual labor time and gives a 10-20% isolated yield of target peptide.2 Conventional synthesis of a dendrimeric antifreeze peptide necessitates over 72 h of manual labor time and produces the target peptide in 40% isolated yield.3 Using microwave-enhanced SPPS, a tetra-branched antifreeze peptide was manufactured in under 5 h in 71% purity. (1) Haney, E. F.; Nazmi, K.; Bolscher, J. G. M.; Vogel, H. J. Biochim. Biophys. Acta - Biomembr. 2012, 1818 (3), 762–775. (2) Haj-Yahya, M.; Eltarteer, N.; Ohayon, S.; Shema, E.; Kotler, E.; Oren, M.; Brik, A. Angew. Chemie Int. Ed. 2012, 51 (46), 11535–11539. (3) Vera-Bravo, R.; Scotter, A. J.; Davies, P. L.; Blanco, L. H. Rev. Colomb. Química 2012, 41 (1), 133–157. (4) Isidro-Llobet, A.; Álvarez, M.; Albericio, F. Chem. Rev. 2009, 109 (6), 2455–2504. This information has been sourced, reviewed and adapted from materials provided by CEM Corporation - Life Science. 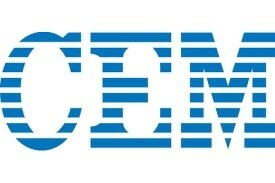 For more information on this source, please visit CEM Corporation - Life Science.